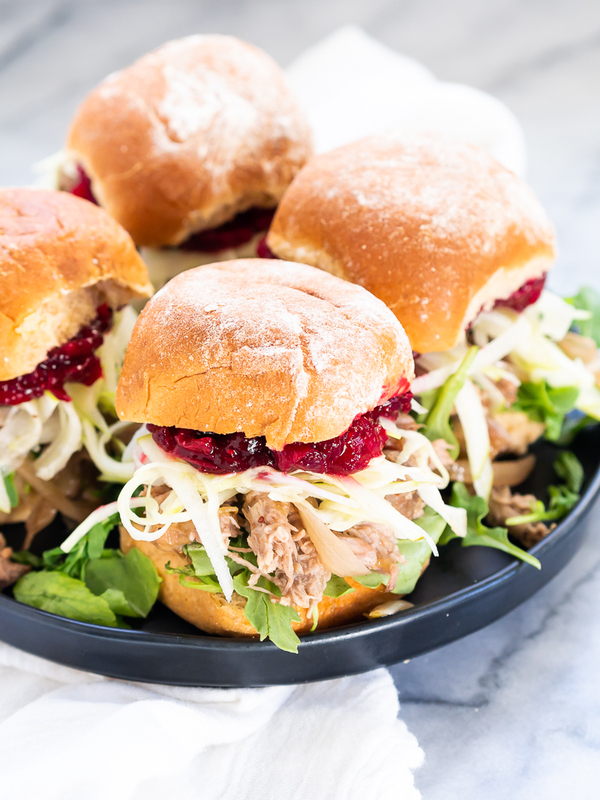 I know cranberry and turkey sandwiches are a thing after Thanksgiving, but as someone who doesn’t love turkey I propose we move to cranberry pork sandwiches. Are ya with me? Who doesn’t love pulled pork? 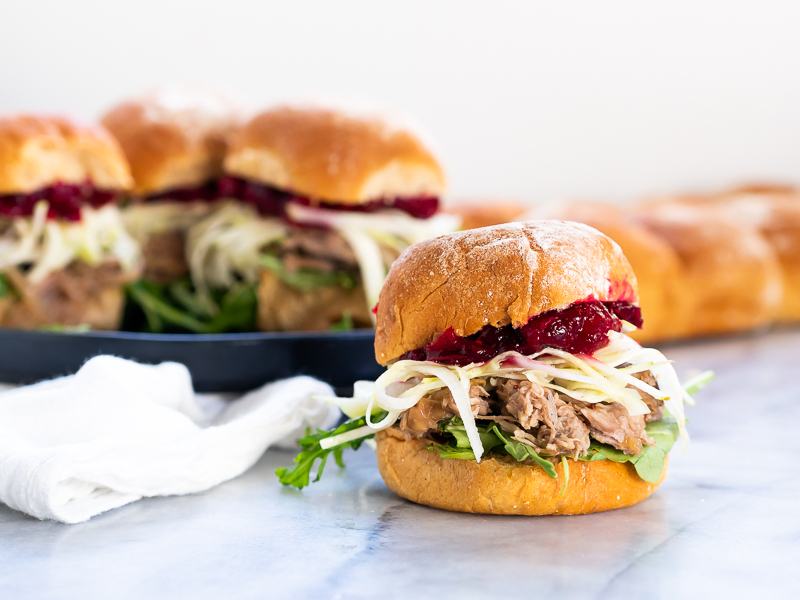 Pork shoulder + slow cooker = tasty, melty, delicious meal with minimal effort. This sandwich has a few key components. First, clearly, the cranberry pork. 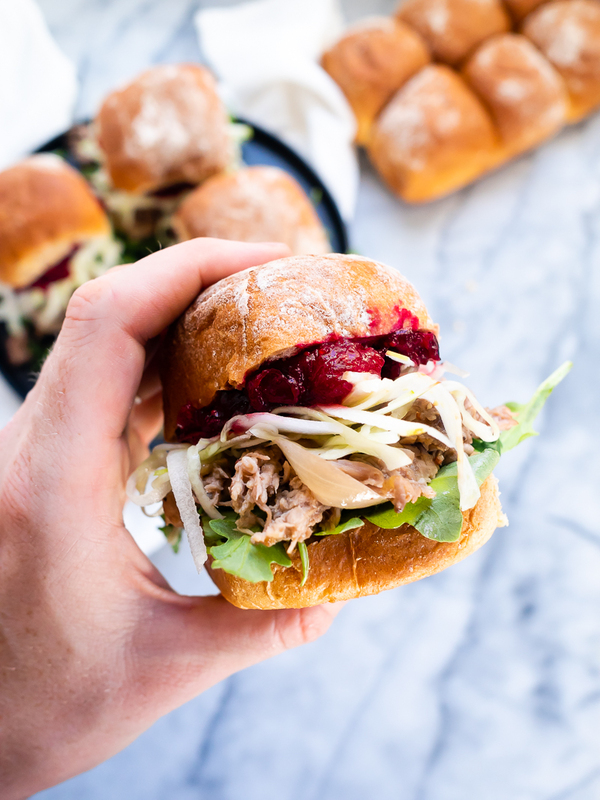 I threw fresh cranberries and a big ol’ pork shoulder in the slow cooker (along with some other goodies) and let it cook slowly through the day. By the end of the day it was easy to shred with forks and put on this sandwich! So so tasty. Second, apple fennel slaw. Oh. My. Goodness. I didn’t even think I liked cole slaw until I made this! Even better: you can make it ahead of time! Third: quick cranberry sauce. 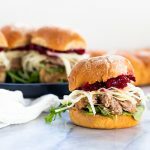 I just simmered my extra cranberries on the stove with a tiny bit of water and sugar for a quick cranberry sauce – easy, fast, and a great addition to the sandwich. 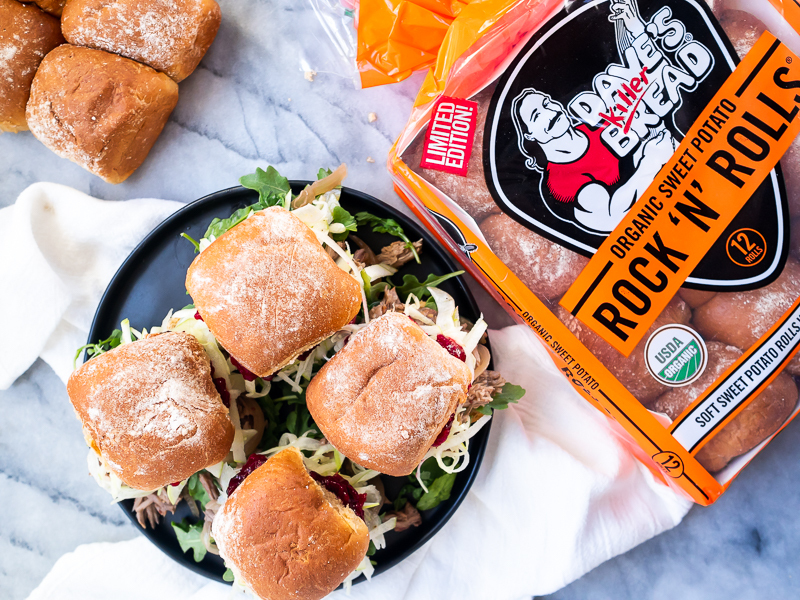 Last and certainly not least – because you cannot have a sandwich or a slider without the bread — Dave’s Killer Bread Rock ‘N’ Rolls®! These limited-edition rolls are so soft. I ended up eating a lot of them plain (or with butter! ), to be honest, because I loved the texture so much! Along side that amazing light texture, they pack a punch with 8 grams of whole grains per serving. They’re made with real, organic sweet potato and a sprinkle of cinnamon spice. They don’t use any weird additives, dough fillers, artificial preservatives, or high fructose corn syrup (YAY!). As if you needed any more convincing: they’re certified USDA organic, Non-GMO, and vegan! What are your go-to post-Thanksgiving meals?